CAS Classes #2 -Day 1. 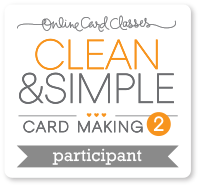 Yay!....It's Day #1 over at Online Card Classes and let me say I'm loving it already! I enrolled just after Christmas and have been counting down the days. After completing this class last year l was pretty excited to get an email about round 2. At the end of today's lesson we had the option to play along with one of the four sketches used by the Teachers and as l loved the style of Kristina's project, l went with that sketch for today's card. I really enjoyed playing with the techniques used on this card and all l can say, "is roll on tomorrow". Thinking l may need to make another one using some different products it was so much fun! Just popping in to share a project l created for the first challenge over at Muse a new challenge blog l discovered while blog surfing today. I loved the inspiration card and thought l would play along. The lovely pop of yellow on white sucked me in totally! I also had a project in mind for a 25th Wedding Anniversary gift that l wanted to personalise a little. A few weeks back l had a blog post in my feed that just made me drool. Kerry at scrapcardschatandchocolate shared a stunning Wine bottle tag that was also for a 25th Wedding Anniversary and l had been wanting to recreate it ever since. Of course l just had to add some pretty silver butterflies, being a Silver Wedding Anniversary and l have also left a space to write the names and date in Silver before gifting. 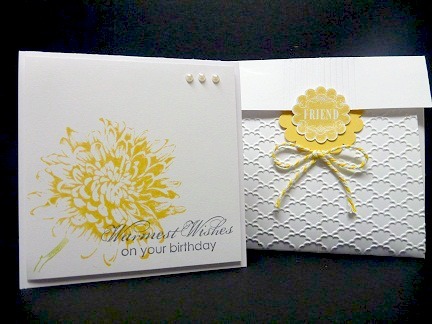 "Thanks for stopping by & Happy AUSTRALIA Day"
Whisper White & Silver Glimmer Paper. 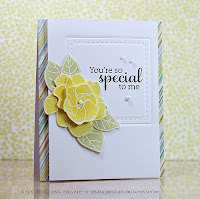 Over at Just Add Ink this week we have a lovely Sketch challenge from Mae to inspire you. I enjoyed playing with this sketch, so much so, l ended up with two cards made for my DT entry. Both very different in style and yet l like them equally, so l am sharing them both with you and would love to hear which one you prefer. 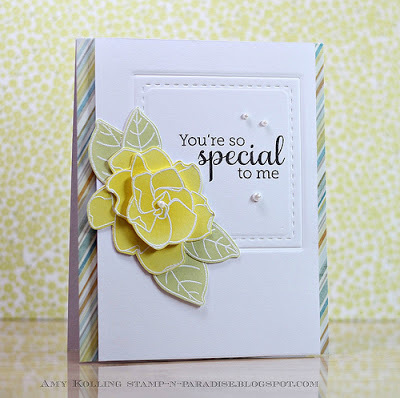 As you can tell, I'm a huge fan of Stampin-Ups Stippled Blossoms set, l just love the beautiful big rose and have yet to stamp it in a colour l don't like! Well l hope you enjoy the lovely Design Team inspiration this week and you can find some time to play along with this very versatile sketch. 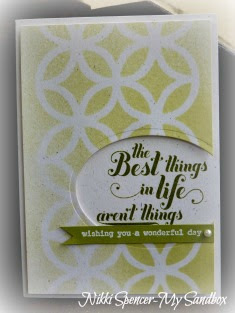 Jute Twine-Rhinestone Strips-Textured Impressions plate Sizzix. Just Add Ink...#149 "Bigshot Blog Hop"
You would have just come from Delys Cram's blog and her beautiful scrap layout, but if not, you can pop over to the JAI Challenge Blog where you can find a complete list of links to all the DT blogs and their gorgeous projects. When deciding on my project, l wanted to use a Die that l had not used much and as my "Petite Pocket" Die has not had the love it should have, l went with that. I really wanted to show more than the obvious use for this and came up with an envelope that will hold a 4"x 4" gift card, a simple project, but a size l use often and I'm always on the lookout for envelopes. I have also included a little picture tutorial on how l made it! This post is rather photo heavy, but that was the easiest way to share the how to. 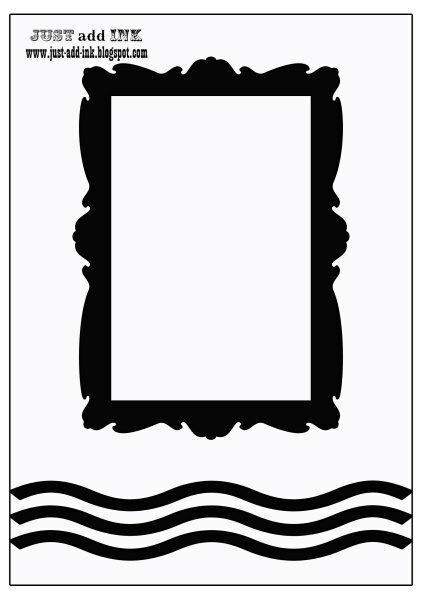 1: Cut a piece of card stock, dsp or even copy paper @ 5-1/2" x 10-1/2" and fold length wise. 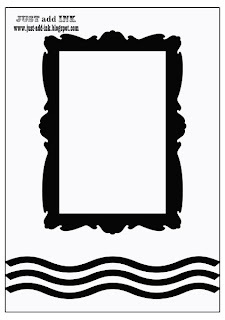 2: Place paper on your Die with the "fold" approx 2mm in from the edge and the fold flap. You can see in the pic, the white area of the Die shape is the part you leave uncovered. 3: After running your paper through the Big Shot it should look like this. 4: This is how it looks opened up and ready to decorate..
5: I trimmed the 2 front scallops to get a nice straight edge for this envelope, but you can leave them and decorate for a different look. 6: I Then embossed the front flap with the Fancy Fan Embossing Folder & used my Simply Scored Tool to put some lines on the top flap. This step helps camouflage the fold line and you could continue to score all the way through to the embossing. 7: As you can see it holds the 4"x 4" card perfectly and is a very simple way to get more from this Die. 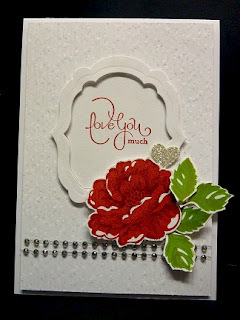 I do hope you enjoy your Blog Hop journey and the beautiful and clever inspiration from the DT. Your next stop is Christine Blain and her lovely Big Shot project using the Petite Pocket Die also. "Thanks for hopping by & have a great weekend"
So, l finally found where my "Mojo" has been hiding...:0) Well actually, it was probably the box of new toys from Stampin-Up that bought it back to life, that and having spent some time in my studio tidying up and implementing some new storage that l desperately needed. Stampin-Ups "SAB" promotion is only days away now and as a Demonstrator l am lucky to be able to get my mitts on some of the great products already, these will be available to customers on January 22nd. 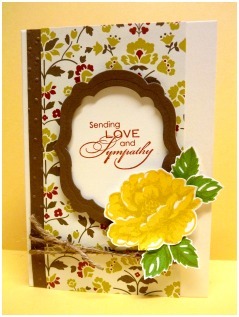 My absolute favourite is a set called "feeling Sentimental" it has 3 lovely images and a Celebrate sentiment. I love the vintage look of these, they are perfect stand alone images, but work just as well with lots of layers. I'm not so sure l have done them justice, as the idea l had in mind when l started playing just didn't eventuate, it's close but not perfect, but l had fun and that's the main thing! There is also a "Sneak Peek" of another new set which will be available in the new Seasonal Catalogue, on Feb 1st. It's called "Oh Hello" and along with the flower, it has some lovely images and co-ordinating framelits. "Thanks for popping by & have a great day"
While doing some Blog house keeping just now, l came across my Daughters Birthday card that l had not yet shared. She is a fan of CAS but still likes a little frill and as l had yet to use my "Doily Sizzlit" all that much, l decided to have a play on her card and combine it with a cute little rosette heart, made on my Simply Scored Board from Stampin-Up. I'm pretty sure this covers the CAS + frills requirement....:0) She seemed to like it and surprised me with the fact that she keeps all my handmade cards....awe! My apologies for the dodgy blog post in your feeds last night, Blogger & Explorer were not playing nice together and in my frustration l accidentally pressed publish instead of preview. 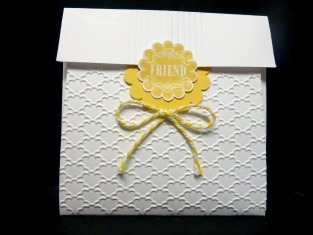 But I'm happy to say l have now resolved all of those issues and l am looking forward to sharing some new creations and sneak peeks of some new Stampin-Up goodies. With the exception of the Kaiser Rhinestone. But all good things must come to an end and it's high time l get back into my studio and have some fun of a different kind! 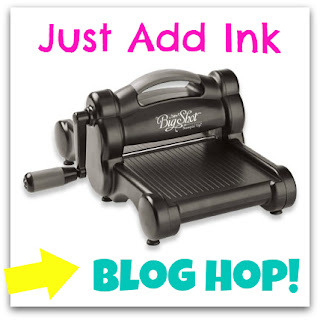 I'm so looking forward to getting back into our Just Add Ink challenges and kicking off the challenge year with a "Big Shot Blog Hop" next Friday January 18th. The Design Team have some wonderful projects to share, so don't forget to pop by and check them out! In the meantime you can have a look at "Our Year In Review-2012" post at Just Add Ink. The Design Team have all chosen their favourite creation from "2012 " to share with you! Thanks for stopping by & have a great day!